Juice is a type of drink made by extracting or pressing the natural liquid from fruits and vegetables. It can also be a liquid flavored with concentrate and other types of food such as meat; a good example of this is clam juice. Juice can be consumed as a beverage, used as a flavouring or ingredient in foods (Yang, and Bristol, 2003). The introduction of pasteurization research methods for business analysis made juice a popular beverage since it enabled its preservation without the need for fermentation. 1. Washing and sorting of the type of foods to be used in its making. 2. Extraction of juice from the selected foods. 3. Straining and filtration of the extracted juice. 5. Filling, sealing, and sterilization. 6. Cooling, labelling, and packing. Market segmentation is the process of dividing broad consumer markets into groups that are made up of existing and potential customers. This division is based on the characteristics that the different categories of consumers have in common which include common interests, similar needs similar lifestyles. The main purpose of market segmentation is to identify the most profitable segments or those that have a high potential for growth so that an organization can focus on them (Venter, Wright, and Dibb, 2015). This is the widely applied method by companies who have the intention of getting to know the right population interested in using their products. Variables such as age, gender, income, occupation, religion, nationality, race and family size are used when segmenting the market. Demographic segmentation can be of great help especially in the automobile industry where we have different classes of people who would want to use different types of cars depending on their income and preferences. Thus, different classes of automobiles have to be made available so as to cater for the needs of the different classes of consumers. This is a type of market segmentation where the population is divided based on their behavior, preference in terms of usage and how they make their decisions. People may have a preference for their usage depending on the activities they associate themselves with. Young people will also prefer using certain products which the elderly may not be comfortable using them. Products are mainly tailored to meet what the different classes like. Also, the buying patterns change according to change in seasons (Susilo, 2016). Under this category, market segments are defined based on people’s lifestyles, their interests, activities, and opinions (Weinstein, and Cahil, 2014). Psychographic segmentation is more similar to behavioral segmentation but takes into consideration the consumer buying behavior. There are people who prefer having into possession the latest products while others will go for anything be it old or latest. Psychographic segmentation puts this into consideration t be able to tell what is actually required by the customers (Mishra, 2016). This type of segmentation divides people based on their geographical locations since there is a high probability that people in different geographical locations will have different preferences when it comes to usage of different products (Brian, 2015). The climatic conditions in these different locations can be the main reason why people’s needs may differ. Application of Knowledge of Consumer Decision Making when Marketing Juice and Smoothie. Consumers will always go through a series of steps before finally making a purchase (Solomon et al. 2014). An organization behaviour has to have this knowledge for its own advantage when marketing its products. It must come up with the best strategies of making consumers settle off for their product whenever they want to make a purchase (Tanner, and Raymond, 2015). 1. Need recognition- at some point, a consumer will always feel the need to satisfy a given want and would thus look for a product that best satisfies the want. In the case of juice and smoothie, an organization has to have knowledge on when consumers would want to buy such types of beverages and be able to make them available to the consumers. 2. Search for relevant information- at this stage, a consumer searches for information about the best product that can satisfy his need. An organization has to always make available the relevant information a consumer can possibly look for. 3. Evaluation of alternatives- a consumer will always evaluate an alternative product that can serve the same purpose as juice or smoothie. An organization producing the juice and smoothie has to ensure that the consumer will still settle for their products even after evaluating the available alternatives by making it them more appealing to the consumer. 4. Purchase decision- consumers at this stage will now decide on which product to settle for but there are factors that can influence the type of brand to settle for. In this case of juice and smoothie, peer influence can play a vital role in what the consumer will go for. The organization has to ensure that the products best satisfy consumers’ needs which will, in turn, be of help in influencing new customers. 5. Post-purchase behavior- after using a product, a consumer will make future purchases of the same product or turn to other products that can serve the same purpose depending on how well he/she was satisfied. 1. Determination of the target population- the organization has to divide the target population demographically so as to be able to determine how well to market the beverages among the different groups. 2. Testing the audience- get to understand the purchasing behavior of the target population for you to be able to come up with the best marketing strategies. 3. Consideration of the marketing strategies proposed- for you to settle for the best marketing strategy, you have to understand the knowledge, attitudes, and behaviors of the target population. 4. Evaluation of selected strategies- once you put the selected strategies into practice, evaluate them to determine whether they are giving projected results. 1. Product- the juice and smoothie processed should actually satisfy the consumers’ needs. Every product goes through a lifecycle and thus efforts are needed in making sure every stage is managed effectively together with its challenges so that at the end, consumers will prefer taking juice and smoothie over other beverages. 2. Price- price will always have an effect on the sales volume of a product and it is always linked to the value of the product (Hague, 2018). The juice and smoothie should attach a price that matches its value for it to sell. 3. Promotion- the form of communication used should be able to relay the intended message effectively and efficiently. This can be done in the form of advertisements, sales promotions, special offers and public relations. 4. Place- this deals with how consumers will access the products. 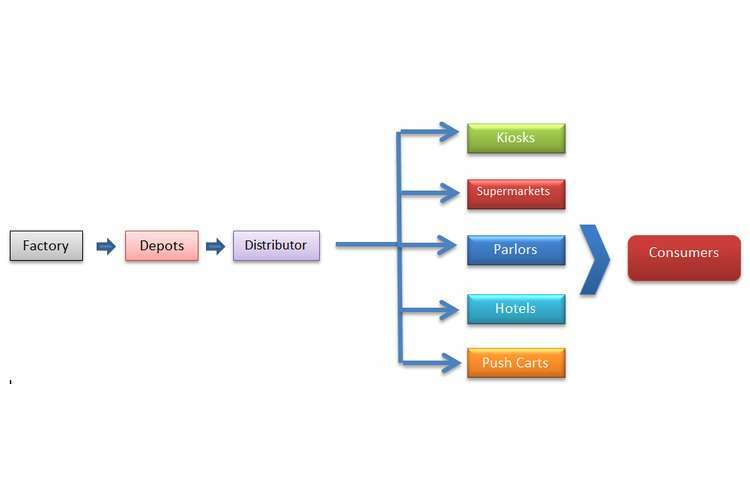 Appropriate distribution channels have to be selected in ensuring the product is able to reach the end user without delays. Many products in the market always have their definite consumers (Sekaran, and Bougie, 2016). Consumers tend to go for a particular brand whenever they want to make a purchase of that kind of product. Coming up with a new product may prove difficult in trying to divert the attention of consumers from their trusted brands to now buy, test and trust the new product as their number one choice whenever such a need arises. For this reason, substantial effort has to be made in marketing the product so that it can supersede the existing products. 1. Internet marketing- this is a form of marketing which is normally carried via the internet. The marketing items are prepared to take into consideration various available approaches and shared using different platforms. 2. Advertisement- this involves the use of traditional approaches such as televisions, radios and the print media to advertise products. The advertisement is normally done at an agreed fee. 3. Relationship marketing- its main focus is on building customer relationships and ensuring there is enhanced customer loyalty. This ensures that gained customers will remain loyal to the organization and will always buy from the organization when the need arises. 4. Undercover marketing- this involves the application of a marketing strategy that consumers are oblivious of. 5. Word of mouth- here, an organization strives to satisfy the consumers in the best manner possible. The impression it leaves in the consumers will determine whether the consumers will promote the organization by word of mouth to new customers or not. 6. Transactional marketing- this is where an organization encourages consumers to buy with shopping coupons, discounts, and huge events. This acts as a motivational factor among the target audience which makes them buy more of the promoted product and therefore can increase sales volume. Adopting these strategies in marketing juice and smoothie may be of great helping in gaining a new market by trying to divert the attention of consumers from existing products. Juice and smoothie being new products in the market need a complete integration of the marketing mix for them to gain a substantial market share. There should be relentless efforts to create awareness among the potential consumers about the two brands for them to be known and consumed by the customers. 1. Antoncic, B., Auer Antoncic, J. and Aaltonen, H.M., 2016. Marketing self-efficacy and firm creation. Journal of Small Business and Enterprise Development, 23(1), pp.90-104. 2. Baker, M.J., 2016. What is marketing? In The Marketing Book (pp. 25-42). Routledge. 3. Brian, J., 2015. Segmentation Marketing: A Case Study on Performance Solutions Group, LLC. 4. Gattorna, J., 2017. Introduction. In Strategic supply chain alignment (pp. 15-21). Routledge. 5. Hague, D., 2018. Pricing in business. Routledge. 6. McDonald, M. and Wilson, H., 2016. Marketing Plans: How to prepare them, how to profit from them. John Wiley & Sons. 7. Mishra, A., 2016. Psychographic segmentation. 8. Resnick, S.M., Cheng, R., Simpson, M. and Lourenço, F., 2016. Marketing in SMEs: a “4Ps” self-branding model. International Journal of Entrepreneurial Behavior & Research, 22(1), pp.155-174. 9. Sekaran, U. and Bougie, R., 2016. Research methods for business: A skill building approach. John Wiley & Sons. 10. Solomon, M.R., Dahl, D.W., White, K., Zaichkowsky, J.L. and Polegato, R., 2014. Consumer behavior: Buying, having, and being (Vol. 10). London: Pearson. 11. Solomon, M.R., White, K., Dahl, D.W., Zaichkowsky, J.L. and Polegato, R., 2017. Consumer behavior: Buying, having, and being. Boston, MA, USA:: Pearson. 12. Susilo, W.H., 2016. An Impact of Behavioral Segmentation to Increase Consumer Loyalty: Empirical Study in Higher Education of Postgraduate Institutions at Jakarta. Procedia-Social and Behavioral Sciences, 229, pp.183-195. 13. Tanner, J. and Raymond, M., 2015. Principles of marketing. University of Minnesota Libraries Publishing. 14. Venter, P., Wright, A. and Dibb, S., 2015. Performing market segmentation: a performative perspective. Journal of Marketing Management, 31(1-2), pp.62-83. 15. Weinstein, A. and Cahill, D.J., 2014. Lifestyle market segmentation. Routledge. 16. Yang, B., Bristol-Myers Squibb Co, 2003. Juice based beverage compositions. U.S. Patent Application 10/091,149.